When you want to copy the odd file, Internet Explorer or the generic FTP Client can be of service. For anything more advanced, you need something tougher. WS_FTP is one of the best clients on the market, and while this edition doesn't add too much, it's definitely one of the front runners. An FTP client has to handle core tasks - uploading, downloading, CHMODding, renaming - and there's not much scope for things to go wrong with these. It's in the more advanced features that they become useful, and WS_FTP has plenty. Amongst the most useful are synchronisation, automatically uploading and downloading between your machine and FTP server, and making it easy to say which files should be handled and what to do about clashes. 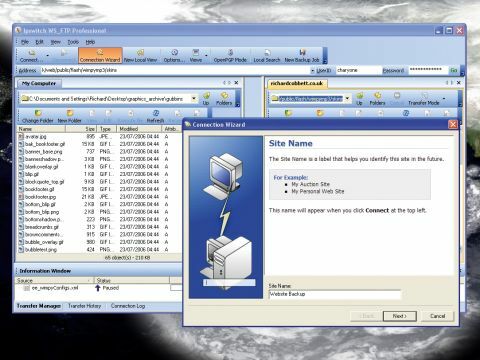 New to this version is a dedicated Backup component, complete with full scheduling, which can push your data up to any FTP site of your choice - along with other storage mediums, including CDs, DVDs, and local networks. There's also a tool called Guaranteed Delivery that double-checks the files on both sides to make sure they match up. It can tie WS_FTP straight into any desktop search tools you have running, and drag and drop entries from a live search without having to move away from the main interface. Thumbnailing is a more specific addition, but it's great if you run an image heavy website or blog, letting you see the contents of a directory in bite-size format, and automatically creating physical thumbnails of any set of images on demand. This takes a while to process, but is very useful - especially given the number of web tools that lack a decent gallery to help you browse your uploaded assets.